General Hospital (GH) spoilers tease that Jason (Steve Burton) and Drew (Billy Miller) will come together for a surprising reason. GH viewers know these two have never gotten along. If we’re being honest, Drew’s responsible for that. It’s not Jason’s fault that he was held captive while Drew inadvertently took over his life. No one can blame Jason for coming back to reclaim his life either. Drew and Jason are both victims of the memory-mapping plot, so there’s no need for grudges. Thankfully, Drew seems to have made peace with his divorce. Watching Sam (Kelly Monaco) move on with Jason has to sting, but at least they’re easing into it. Jason and Sam might be breaking a record for the slowest reunion of all-time! Drew’s got more important things on his mind these days. He’s more focused on familial love than romantic love right now. That may come into play during Jason and Drew’s upcoming chat. The week of December 10-14 will bring a heartfelt conversation for these brothers. They’ll meet up to clear the air and discuss some crucial matters. Jason may talk to Drew about Oscar’s (Garren Stitt) treatment. He shared a warm moment with his nephew shortly after the cancer diagnosis discovery. Jason would certainly love to see Oscar recover and stick around for many years. Despite the issues between them, Jason will always have Drew’s back when it comes to family. If there’s ever anything he needs, all Drew has to do is give Jason a call. Jason might point that out to Drew and earn some gratitude. However, there could be a shocking reason for this conversation, too. General Hospital spoilers say Margaux (Elizabeth Hendrickson) will deliver the flash drive on next week’s new GH episodes, December 10-14. She’ll finally give it to Drew and apologize for being such a whiny schemer. Drew may bring up the flash drive to Jason and mention that he has the chance to replace his memories. We can’t forget that something unique binds Drew and Jason together as well as sets them apart. Jason has a head full of very real, intense memories. Drew has those same memories, but they only exist in his mind. He didn’t live them at all, which has to be awfully disconcerting. 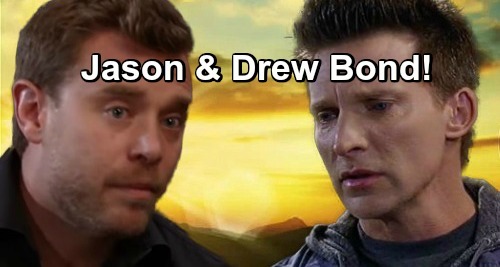 General Hospital spoilers say Drew will have to decide what to do, so he may get some advice from Jason. There’s no guarantee he’ll take what he’s offered, but he could use all the help he can get. Drew might wonder what Jason would do in his position. Jason may not know for sure, but he might admit he’d be tempted to have the procedure. Sometimes risks are worth it if the payoff brings you peace. Regardless, it’ll be great to see Drew and Jason getting along. Plenty of GH fans would like to see these twins become close one day. They deserve to have a true bond as brothers, so Drew’s memory reversal could be a step in the right direction. We’ll give you updates as other news comes in. Stick with the ABC soap and don’t forget to check CDL often for the latest General Hospital spoilers, updates and news. General Hospital Spoilers: Valentin’s Bomb Drops – Sasha’s Not Really Nina’s Daughter?